Shandong (literally means east of mountain) takes its name from its location to the east of the Taihang Mountains. It is situated on the eastern coast of China, in the lower Yellow River valley. The Shandong Peninsula in the east protrudes between the Bohai Sea and the Huanghai Sea from the land mass and faces the Liaodong Peninsula in the north across the Bohai Straits, forming the maritime outpost of the nation's capital, Beijing. Situated 34"25"-38"23" north latitude and 114"36"-112"43" east longitude, the province has an area of 153,000 square kilometers, of which 55% is plain. Shandong has a warm-temperate monsoonal climate, with hot, rainy summers and dry, sunny winters. It has a mean annual temperature of 10.5oC-13.5oC -- the hottest month, July, averaging 24-27oC and the coldest month, January, -4-1oC -- and a mean annual precipitation of 550-950 mm. It is divided into 17 prefecture-level cities, 31 county-level cities and 61 counties, with a population of 90.79 million by 2000. Lu Cuisine (Shandong Cuisine) is one of the Eight Great Cuisines in China. Renowned traditional local products include clocks and watches of Yantai, porcelain of Zibo, kites of Weifang, shell carving and beer of Qingdao. 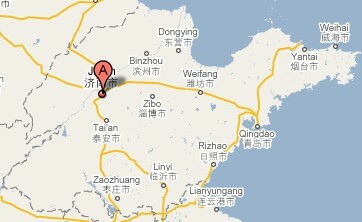 Shandong Province is called Lu for short. Shandong is a key production area of grain, cotton and oil crops. It usually ranks first or second in production output. Shandong is also well known for its tobacco, fruit, peanuts, tussah silks, meat, and marine products. Its major mineral deposits include coal, petroleum, iron, aluminium, and gold. The coastal area is abundant in fish and salt. Shandong's industry covers oil extraction, processing, machinery, electric power, chemicals, foodstuff, textile, arts and crafts, and papermaking, etc. With railway as its mainstay of transport, Shandong is one of the provinces with the most dense highway network. It has seaports like Qingdao, Yantai, Weihai, and Rizhao, etc. Major cities are Jinan, Qufu, Qingdao, Yantai, Weifang, and Zibo. Shandong is rich in historical and cultural resources, and gifted with beautiful landscapes, with 157 cultural relics preservation sites under the state protection. Among its famous scenic spots and historical sides are Taishan Mountain, Laoshan Mountain, the Lingyan Temple, seaside of Jiaodong Peninsular, Confucius Family Mansion, Confucius Woods and Temple in Qufu, etc. Qufu and Jinan cities are famous historical and cultural cities in the world. Jinan, capital of Shandong Province, is known as the City of Springs with the famous Daming Lake and at least 72 famous springs.